4 ) Follow up to each school / teacher and supervised access for 32 hours for school on prevention projects to promote well-being at school, lasting at least six months in the single reality , arising from the laboratory directly by teachers. From research - listening has emerged that the main requirement of the boys is to have good relations with teachers and good communication in the classroom and with his comrades . Teachers , for their part , they see the difficulties of the guys in relationships with other adults, but also admit their difficulties in communicating with the kids, with colleagues and with parents. Also clearly show motivation and interest in making the school what it should be : a place not only for teaching but also for educational development and growth. This project has meant that in 63 schools were initiated 68 actions that respond to the manifestations of disaffection among young people focused on specific areas: - The time of reception in the first year - The improvement of relations in class with the kids or working relationships with colleagues - The reinforcement of existing projects based on: bullying prevention and care of the emotions of students - Planners with the involvement of local governments , parents, population - Surveys on the basis of the perception and the importance of good relations in learning and in school life. I think that this project is very interesting for many reasons. What , in my opinion , is the most significant and innovative is that it provides a practical example of a training for teachers. The laboratory activities allow teachers to explore new methods, to discover new skills, to deal with other colleagues. Teachers have the opportunity to think, in an organized way and therefore more productive , about the way of teaching and, in general , how to stay in school. Not always school is able to deal effectively with bullying and, in general , early school leaving . Often it overlooks the time of reception of the student , its inclusion in the school , hi emotions, his problems. Sometimes school also overlooks the pupil relationships with his peers and their relationships with teachers. The project shows that “stay well in school” is crucial for the success of the pupil's school career . School activities must strive for this objective and teacher training should pay attention to this objective. Teachers need to be trained without neglecting their relational skills so that their activities should be implemented in order to facilitate the inclusion of pupils and the establishment of peaceful relations between pupils and between pupils and teachers. 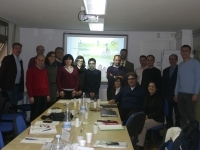 The fourth partners’ meeting took place in Florence (IT) on 15 December 2014. The meeting had the objective to check the activities carried out since the third meeting of the project and share and assess the in progress results. A special focus has been dedicated to the presentation of the strategies to solve the case scenarios.